Photographer and pilot Alex MacLean wanted to learn more about the Keystone XL pipeline, which if approved will carry oil from Canada to the Gulf of Mexico, so he decided to take pictures from above of the tar sands that will supply oil to the project. 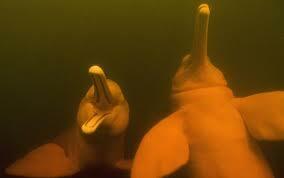 “The scale of the operation is staggering,” MacLean told The Huffington Post. It’s “mind-boggling,” he said, how expansive it is, and how much money is being poured into drilling and strip mining for the viscous petroleum product that will give the Keystone XL pipeline its oil. 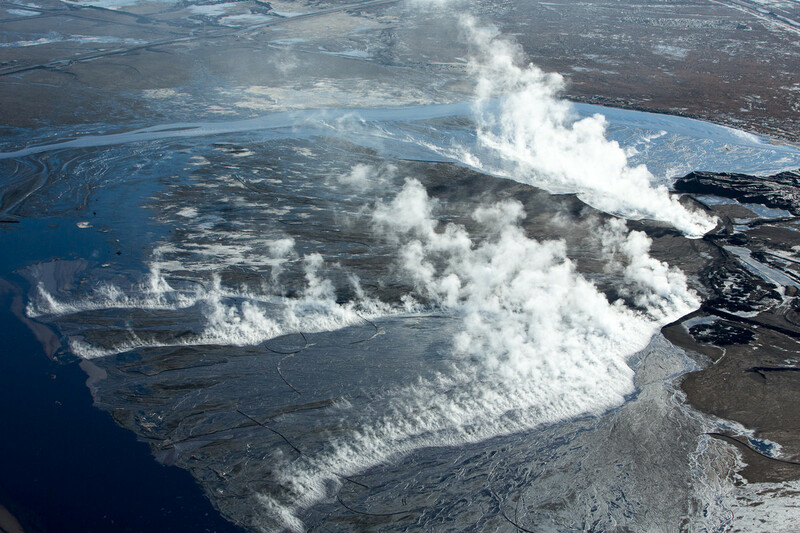 Hot waste fills a tailing pond at the Suncor mining site in Alberta. 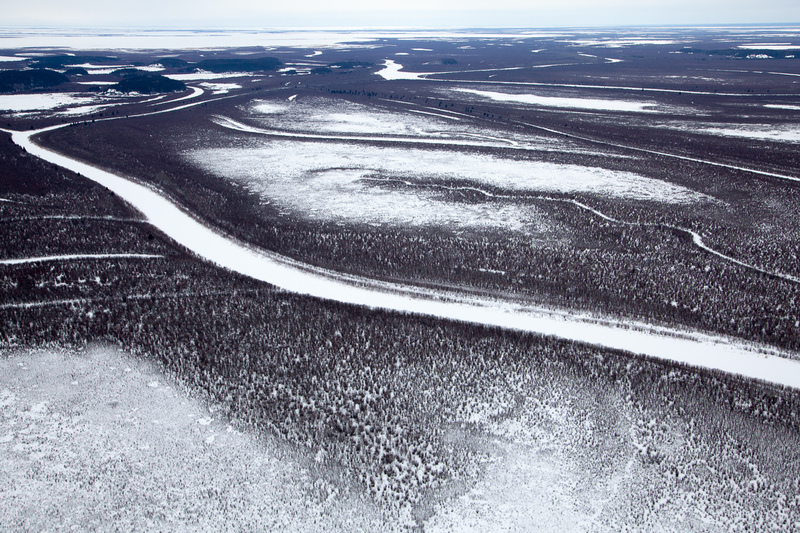 MacLean took photos from 1,000 feet above northern Alberta’s oil operations. 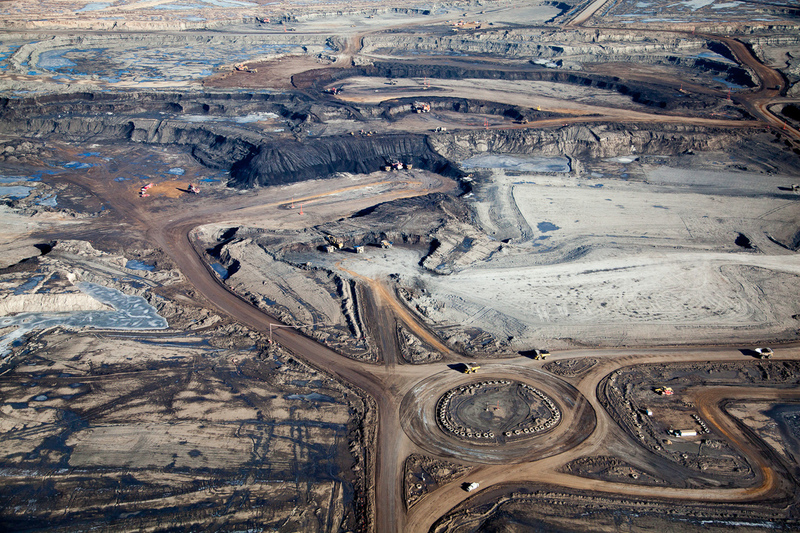 The tar sands, more commonly referred to in Canada as the oil sands, are the world’s third-largest petroleum reserve and underlie an area roughly the size of Florida. 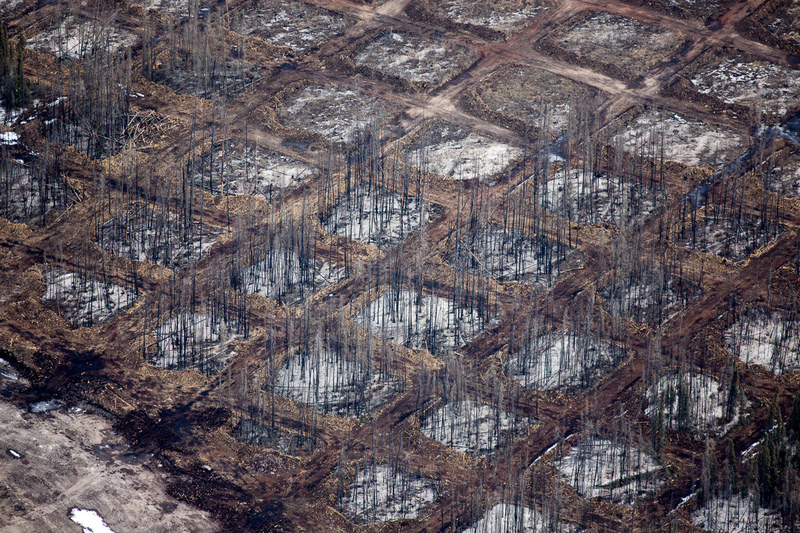 While the Alberta government says only 3 percent of the area is suitable for strip mining, in which forest and bog “overburden” is stripped away, that still amounts to about 1,850 square miles — an area larger than the state of Rhode Island. Flying above wilderness beauty punctuated by slick oil sheens and puffs of smoke from a refinery, “you realize how wasteful we are,” MacLean said. 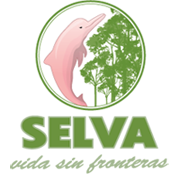 As of early 2013, mining operations had disturbed about 276 square miles of boreal forest in the region, according to the Pembina Institute, a nonprofit Canadian think tank focused on energy. The area totals over half the size of the city of Los Angeles. Checkerboard clearing of the overburden at the Syncrude Aurora North Mine Site in Alberta. 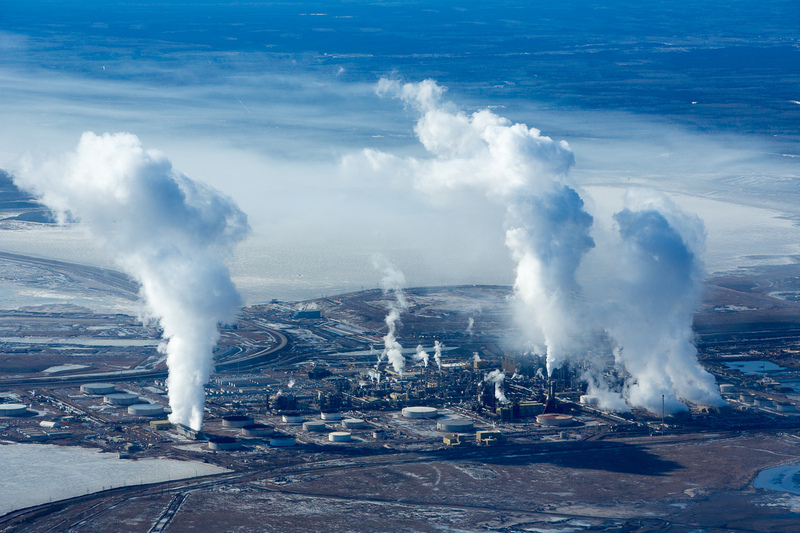 A University of Toronto study published earlier this year in the Proceedings of the National Academy of Sciences found that official environmental impact assessments have likely underestimated toxic emissions from tar sands operations. Another recent study found that the Alberta work ispolluting groundwater and the nearby Athabasca River. The oil derived from the tar sands bitumen is 14 to17 percent more carbon intensive over its lifecycle than traditional crude. If built, the Keystone XL pipeline would bring 830,000 barrels of this oil to market every day — adding several million metric tons of carbon dioxide to the atmosphere annually. Steam and smoke rises at Syncrude’s Mildred Lake upgrade refinery. 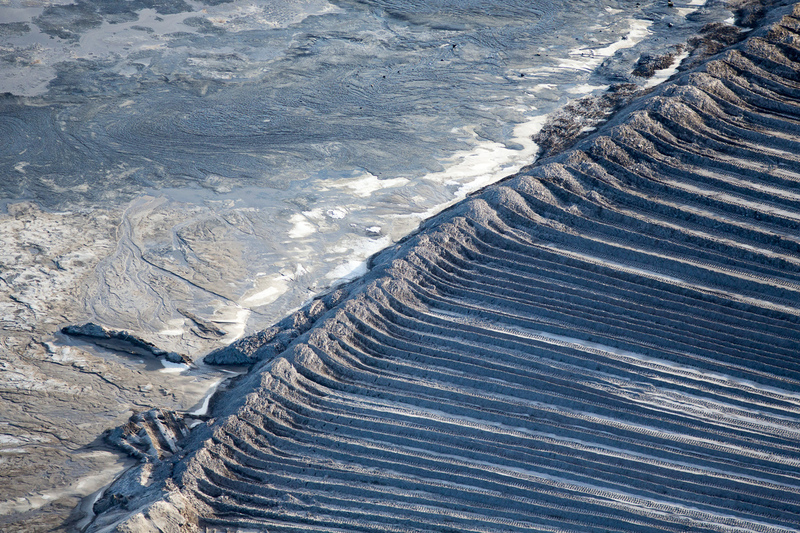 Skimming operations are seen at a tailings pond at a Suncor mining site in Alberta, Canada. 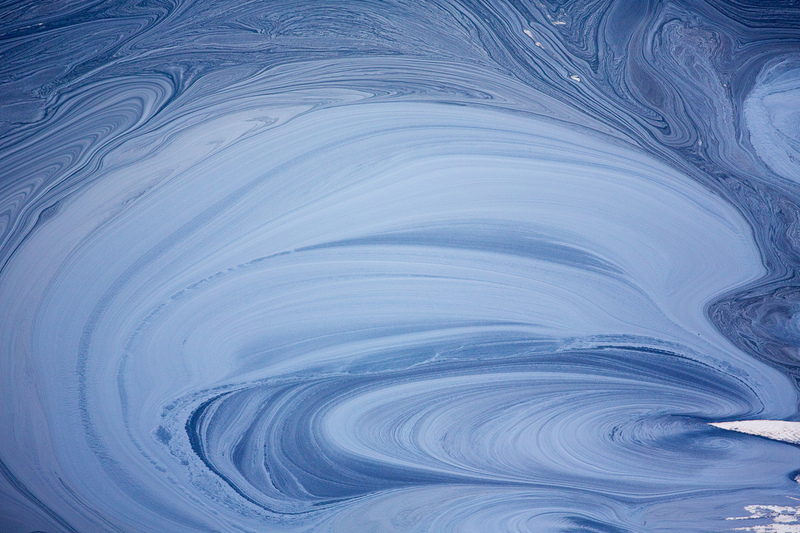 Surface oil on a tailings pond in Alberta, Canada in 2014. The earthen wall of a tailing pond in Alberta, Canada in 2014. 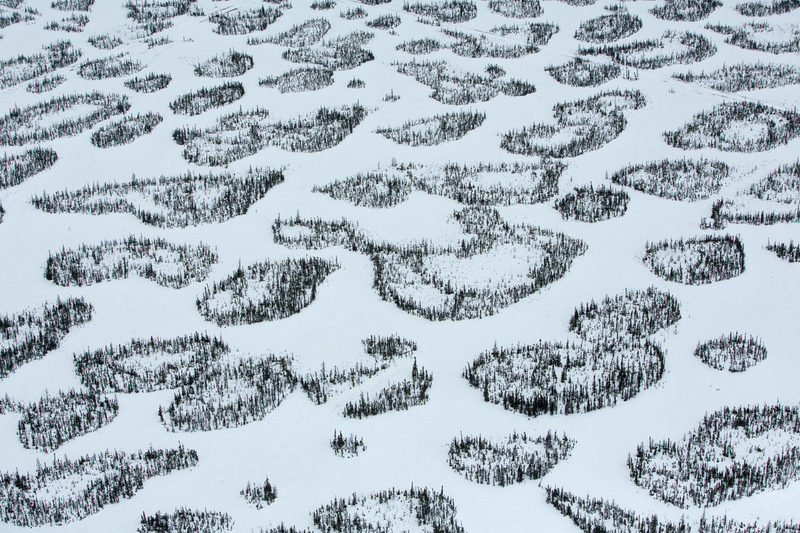 Patches of boreal forest are intertwined with snow-covered muskeg, a type of soil, in Alberta, Canada. 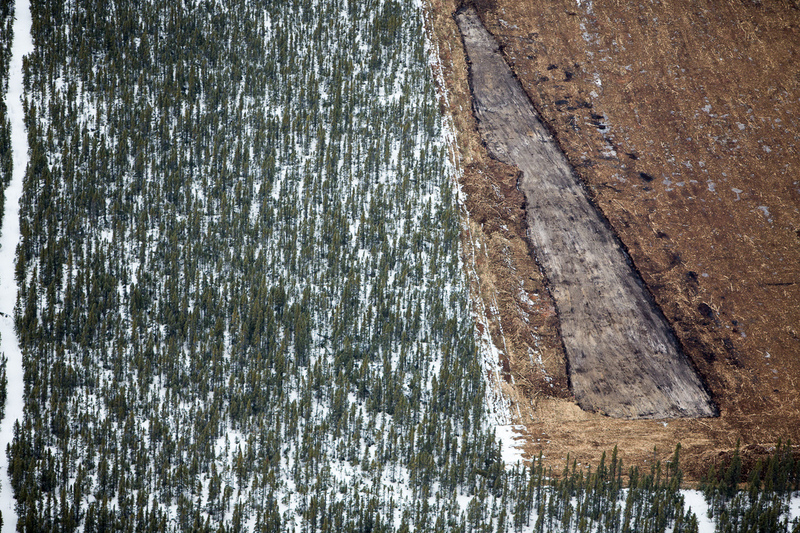 Forest has been removed for an exploratory well pad at the Shell Jackpine mining site north of Fort McMurray, Alberta. 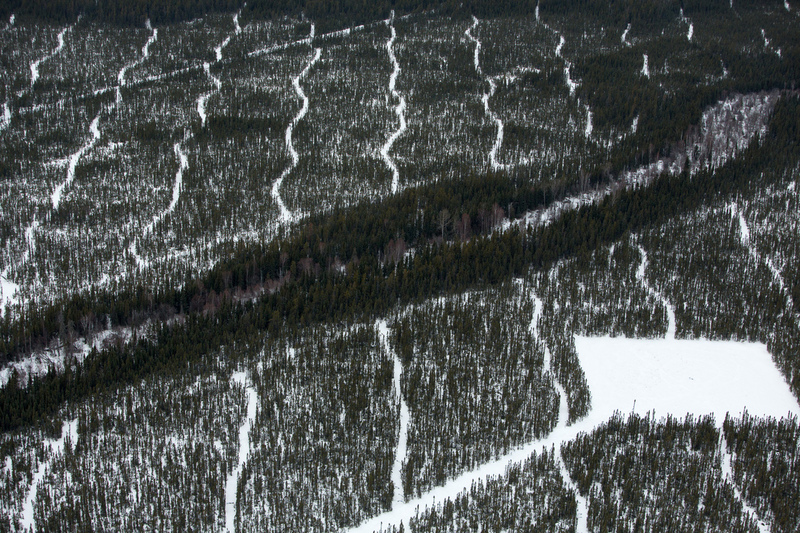 Seismic lines and a well pad at the Shell Jackpine mining site in Alberta. 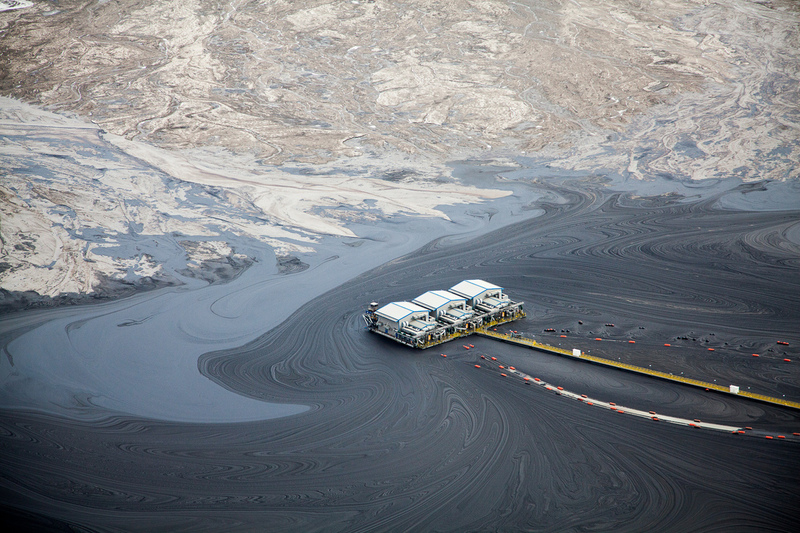 Bitumen is excavated at the Syncrude Mildred Lake mining site. Giant tires line the traffic circle. 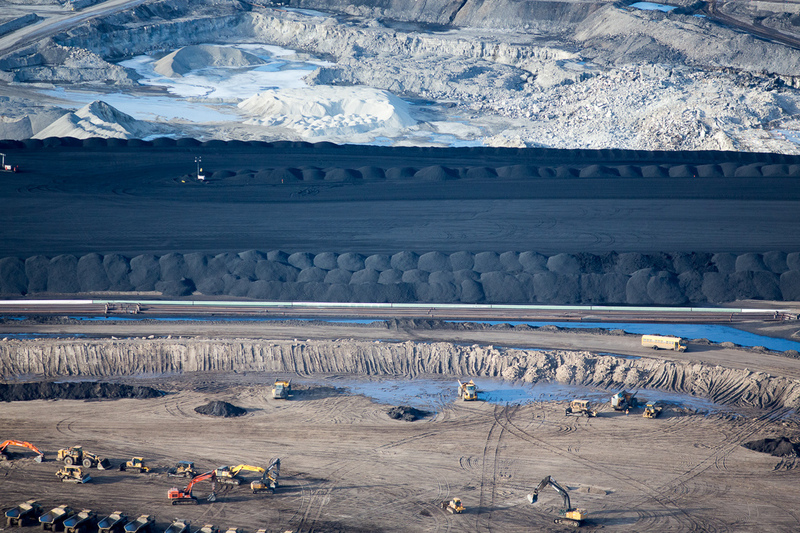 These are piles of uncovered petroleum coke, a byproduct of upgrading tar sands oil to synthetic crude. Here the Athabasca River runs in to Lake Athabasca in northern Alberta, Canada in 2014. MacLean’s work was made possible with support from the Pulitzer Center on Crisis Reporting and The GroundTruth Project as part of a report to be published on GlobalPost next month. ~ by FSVSF Admin on 2 June, 2014.